A man accused of bombing a Düsseldorf train station in July 2000, targeting Jewish immigrants, has been acquitted. A court ruled there was insufficient evidence to convict the man, an alleged neo-Nazi, who was charged with 12 counts of attempted murder. The pipe bomb badly injured 10 of the 12 people, including a pregnant woman who lost her child and one of her feet. Ahead of the verdict, prosecutors said an acquittal would be "the most serious legal error" in Düsseldorf's history. 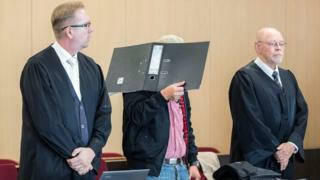 During the trial, several witnesses withdrew or changed their statements, resulting in judges releasing the defendant - named in court as Ralf S - from pre-trial detention in May. German police had questioned the former soldier and known gun fanatic in the wake of the bombing at the Wehrhahn commuter train station. Unable to charge him, they remained without a formal suspect for 17 years. While serving prison time for an unrelated charge in 2014, the now 52-year-old allegedly boasted about carrying out the attack to a fellow inmate, using a racial slur against immigrants. In 2017, officers then arrested and charged Ralf S for the bombing. He denied any involvement. Prosecutors pointed to a number of admissions Ralf S had made in recorded telephone calls. However his defence lawyers countered, saying witness testimony was unreliable and that there was no evidence to connect him to the scene of the crime. Ralf S may be a "chatterbox and a stupid gossip", they said, but that did not make him a dangerous extremist. The 2000 bomb blast was one of a number of xenophobic attacks at the time that shocked Germany. The victims were mostly Jewish immigrants from the former Soviet Union, returning from German language classes in the area. The authorities' inability to solve the case raised questions about the initial investigation, particularly after it came to light in 2011 that German intelligence agencies had turned a blind eye to a neo-Nazi cell, which committed 10 racially motivated murders, two bomb attacks, and several bank robberies between 2000 and 2007.